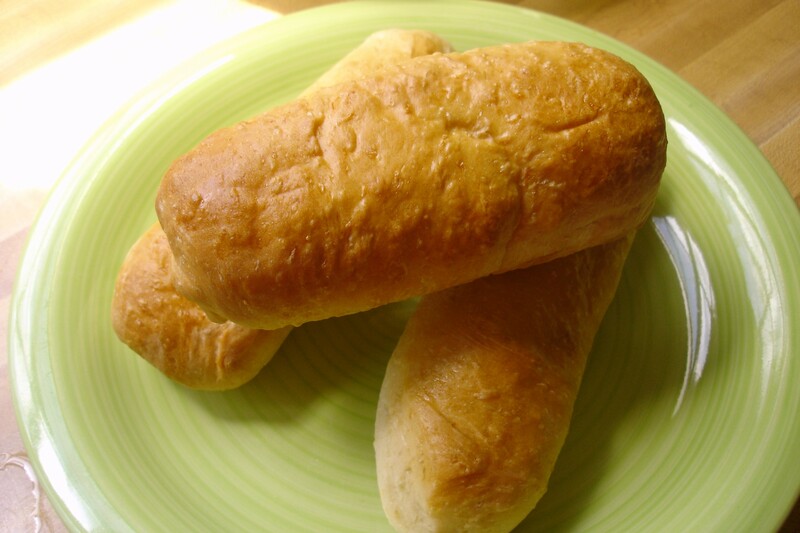 Several days ago Abby of MixItBakeIt shared a recipe for Pepperoni Rolls with Kayte who then shared it with me. The result of all this sharing was a day of bread baking with Kayte. And that bread baking resulted in a tasty little treat that was a hit with everyone in her house and in mine. Think of them as home made Hot Pockets but WAY WAY better. The pepperoni is microwaved until the pepperoni renders its fat and then some of the fat is added into the bread instead of butter. The flavor of the pepperoni is part of the dough. 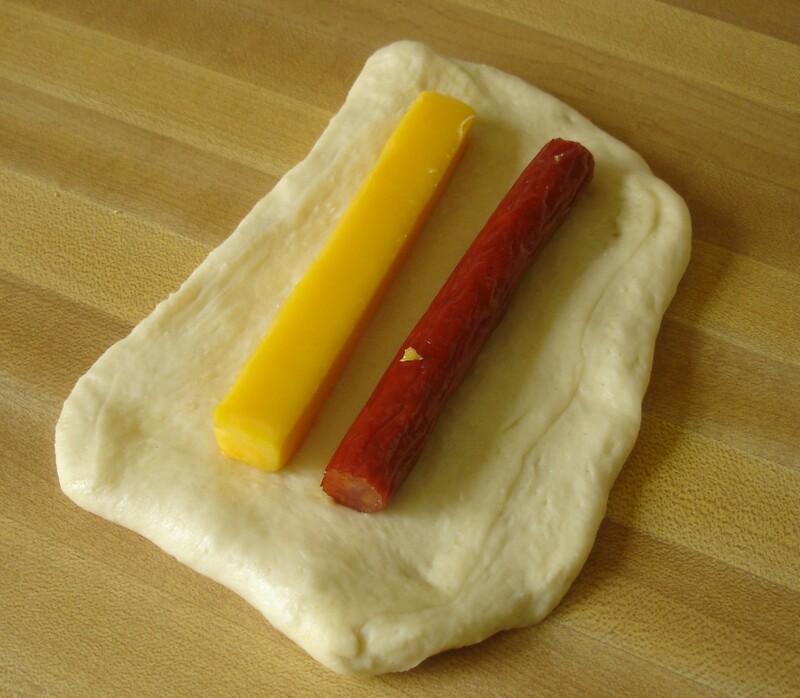 Inside the dough are sticks of pepperoni and I added cheese sticks (which didn’t melt). The only alteration I made in the recipe, besides adding the cheese, was to have less meat than was called for. The recipe called for four pieces and I only used one. It really needed more, but I didn’t have enough. As it was I filled two of the eight pockets with deli ham and shredded cheddar cheese. THAT was good too. These came out beautifully browned because of the egg wash and the dough stayed soft but slightly chewy. You could fill these with just about anything. Like mozzarella cheese and marinara sauce instead of dipping them in the sauce. OR you fill them just with tons of shredded cheese. Or taco meat. Or use butter in the dough and fill them with jam or chocolate. Like I said. Endless possibilities. Kayte has them posted on her blog and when Abby posts them we will link to the recipe. So come on back later. There is just something about trying out recipes that normal, everyday people have made and liked. Many cookbooks come from test kitchens. They aren’t about what ‘real’ ‘normal’ people have made. Not saying there aren’t some great cookbooks out there. I have a few some okay LOTS in my library that acome from everyday people. But making/baking/cooking a dish/dessert found on another blogger’s page is different. And there are lots of terrific bloggers out there (You know who you are) who are cooking from their homes and sharing wonderful recipes with us. I now have a go-to roll recipe that I use at least once a week. I found this recipe on Romaine’s blog – Salad in a Jar.The dough starts in the bread machine and then you can make loaves or rolls. 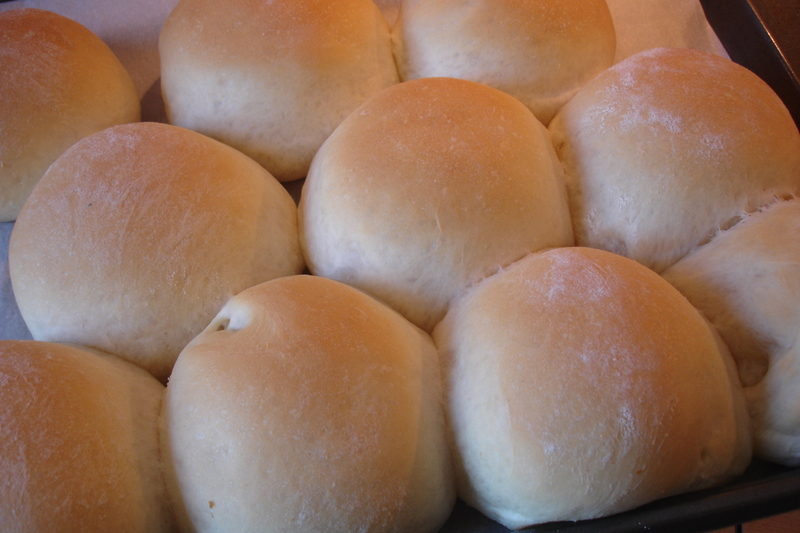 I prefer the rolls and have made them tons of times in different shapes and sizes. 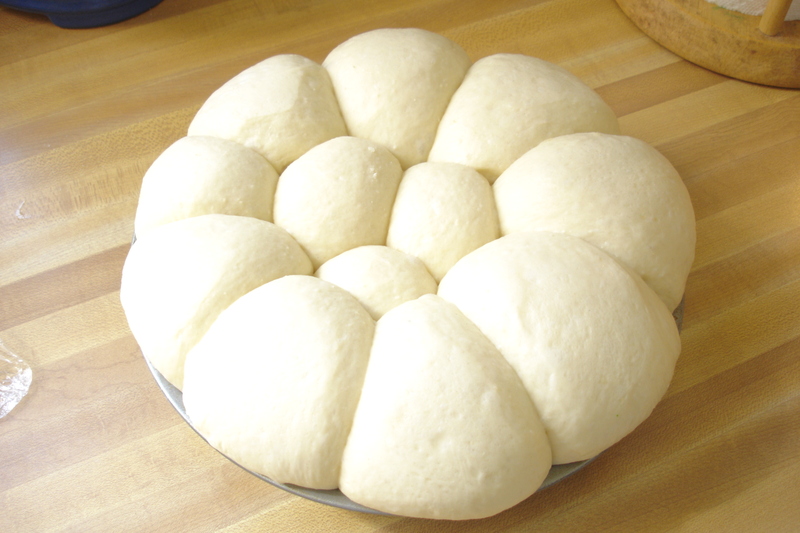 We especially love making larger (10 – 12) rolls to use for lunch. I usually weigh out 2.5 oz per roll. 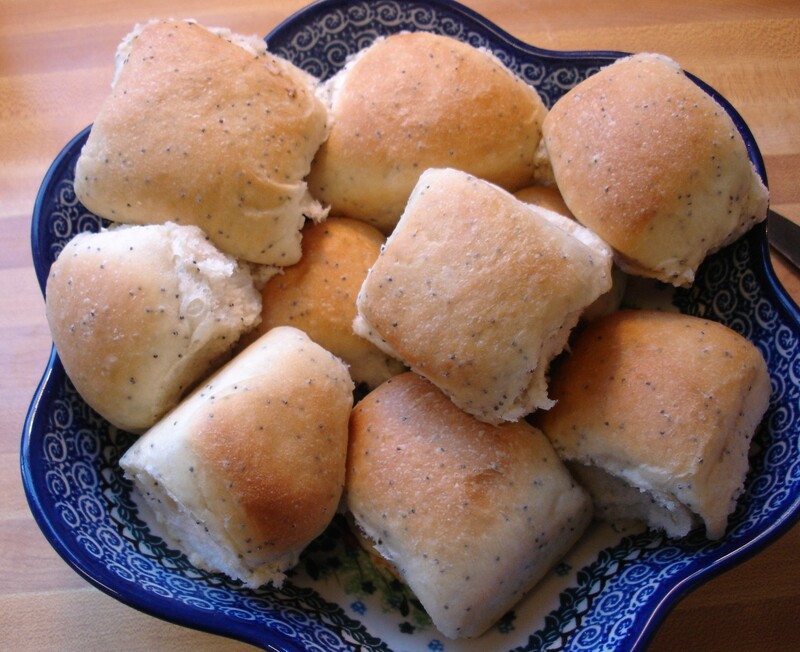 But they are also great for dinner rolls. Finding a simple to fix dinner entree is not easy either. But Tracey of Tracey’s Culinary Adventures managed to find it. Slow Cooker Pulled Pork which I served on Romaine’s rolls. Perfect match. Tracey adapted the recipe from The Way the Cookie Crumbles (who got it, sort of, from her brother) and I changed it just by adding Tony’s creole seasoning. Since the first time I made it about 2 months ago I have made it twice more. Yes!! It’s that good and that simple. 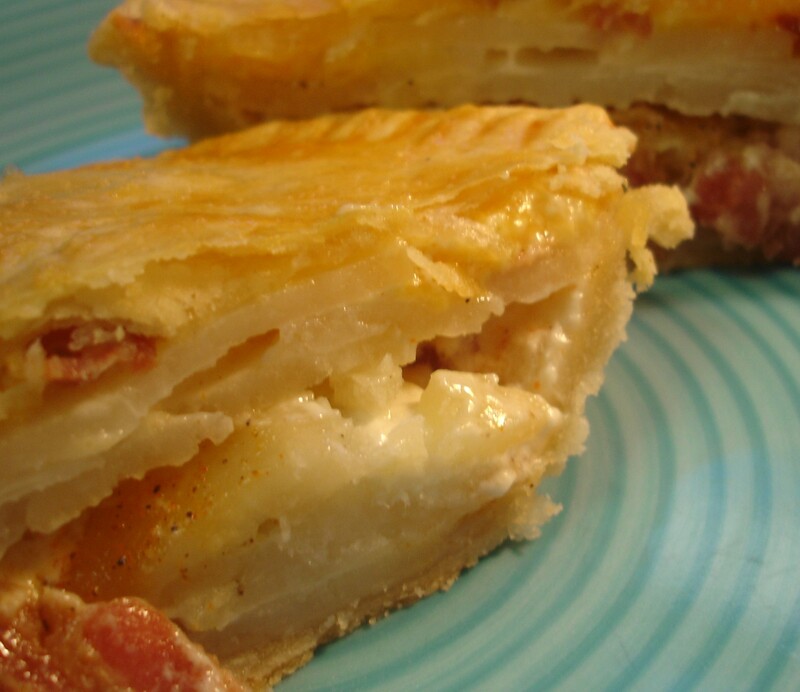 And why you are visiting Tracey check out her Potato-Bacon Tart which she ‘borrowed’ from Melissa d’Arabian the New Food Network Star. I made 3 small tortes from the recipe – each one different. Clockwise from the top: Just as Tracey wrote it; mixed with Cheddar Cheese instead of Gruyere; topped with provolone. It was ALL good. And of course you have to have dessert. How about Peanut Butter Chocolate Chip Pound Cake? Jessica posted this one earlier this week and it was just too good to pass up asap! This was SOOO good. Chocolate chips. PB chips. PB in the batter. How can you go wrong with that. Well, you can’t (except i over baked it just a tad). Perfect simple dessert. Thanks to all my blogger buddies who keep coming up with these excellent recipes whether adapted from cookbooks or self created. You have made my meal planning so much easier. I finally picked up Ellie’s second cookbook – So Easy. And it is a great companion to her The Food You Crave. The CEinMB group uses both plus her online recipes. I have found that many of the recipes in the books ARE on line, but I like to have the book in front of me. Just call me (Really) Old School. This weeks recipe – Marinated Chicken and Grape Skewers – was not one my Wonderful Family would enjoy, so I offer you a rewind of a recipe I missed. This was Marthe’s Pick for October 2009, before I joined the group and you can find the recipe on her site. The reason I picked the quesadilla is because of Tracey. 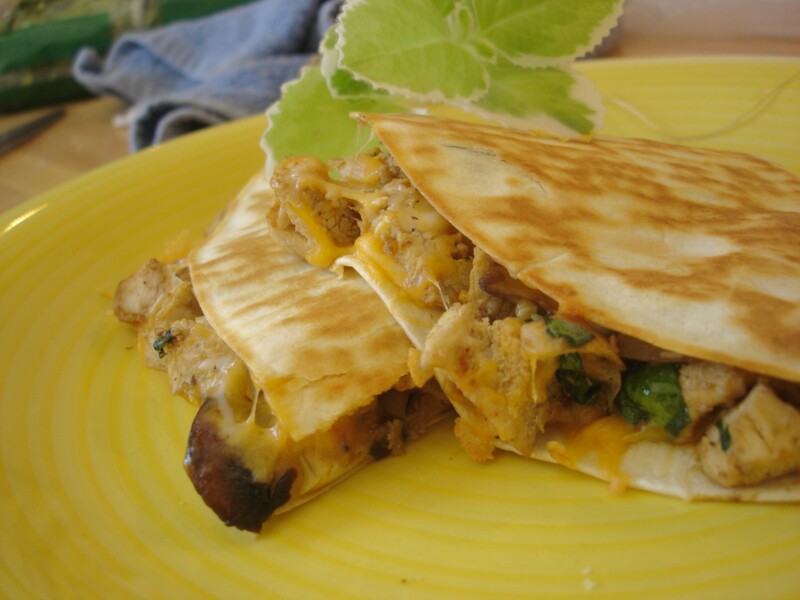 She started talking about quesadillas on Twitter.l She posted a great BBQ Portobello Quesadilla recipe on her blog. And then someone else mentioned them and then I decided I HAD to have a quesadilla. I am so easily manipulated. I ate them for 4 days in a row they were so good. Well, one recipe DOES make 4 servings. I couldn’t eat it just once. Not possible. My apologies to Elina of Healthy and Sane. Don’t hold my family’s tastes against me. I saw this dish first on Tracey’s Site At Tracey’s Culinary Adventures where you can find the recipe. Thanks, Tracey. This was really good. Tracey has some great recipes. She is also a Tuesdays With Dorie Baker, a member of Sweet Melissa Sundays and Martha Stewarts Cupcake Club. Visit, you won’t regret it. Terri is in Malaysia so many of her ingredients are not available for me. But I still love reading her blog. And have tons of her recipes marked. Well, I just wanted to share. Okay!!! Now that I have your attention. You will notice that it is not a picture of Dorie’s Brioche Plum Tart!! I still have some of that fantastic Carrot Cake from Dorie (and this is a catch-up) and this Zucchini Bread left. I just couldn’t bring myself to make a tart as well. 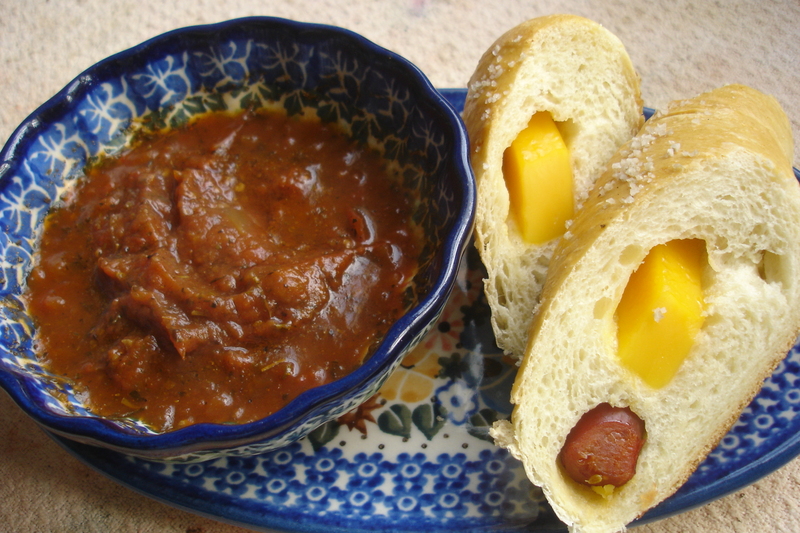 – recipe from Colorado Farmer’s Market Cookbook. Preheat oven to 350. Beat eggs until light and fluffy. Add sugar, vanilla, almond extract and oil. Blend well. Add in zucchini. I served the Carrot Cake with Home Made Vanilla Ice Cream. The recipe for the Cheesecake Ice Cream came from Megan of My Baking Adventures. And I added about 1/2 – 2/4 cup of pureed strawberries. Can I tell you HOW GOOD this was??? And next time I want to add some graham cracker crust to the ice cream itself. I could have eaten the whole container BY MYSELF. But I shared – a little!!! Regular cheesecake layered with chocolate, then caramel, then chopped pecans on top of the crust. (One mistake – don’t use a ganache that will harden LIKE A ROCK – makes it hard to heat) I also swirled a little chocolate in the cheesecake itself. Had enough yet??? Okay. UNCLE!!! But I will leave you with just a photo or two!! The ONE good thing about summer in the Deep South!!! My apologies to Denise of Chez Us for not baking with her this week. Thanks for taking the time to come by for a visit and a bite! Too Hot for Dorie! Blogger Bytes Instead!! Yes, I didn’t think it would come this soon, but it has. Predicting 101/102 degrees for the next 3/4 days. Now, I know some of you in the West – Arizona, New Mexico, are used to that . And I know that it is not unusual around Phoenix to have several days of hotter weather, but it’s the humidity here that gets you, not so much the heat. So with the heat index it will closer to 110/115 for the next few days. So, yes, IT IS TOO HOT TO BAKE!!! Sorry! I never thought I would say that, but, it’s true. Fellow Foodies – No TWD today. But head on over the Tuesday’s with Dorie and see how the rest of the group fared with Andrea’s Pick – Coconut-Roasted Pineapple Dacquoise. Since I didn’t bake, I will tell you about some Blogger Bytes from the kitchen. This is a quick, easy, and delicious seafood dish from Tracey’s Culinary Adventures. Tracey used fettuccine. She modified the recipe from The Life and Loves of Grumpy's Honeybunch who had participated in the Presto Pasta Night. It came originally from Cooking Light using Penne Pasta. WHEW!! I used just plain broad noodles (cause I just didn’t feel like making pasta). No matter what pasta you use, use this recipe – it’s good. Thanks to Tracey and Shelby. GREAT dish!! Thanks to Marie at Proud Italian Cook for this yummy chicken dish. It has it all – flavor, GARLIC, peas, potatoes, wine. Delicious!!! Whew!!! Finals are over. Summer is here. Maybe I will finally have time to have some fun in the kitchen. I didn’t get to the TWD this week, but I am looking forward to the Lemon Tart next week. And I can take my time cause the semester is over, my Son is graduating from High School, and I going to do some experimentation with bread, baking, and cooking. I used some fellow bloggers ideas this week, just a couple. Thanks to Joelen of Joelen’s Culinary Adventures for the Pork Chop fried with Panko Bread crumbs. I usually use just flour, but the Panko were soooo much better. (I really need to practice my presentation skills!!!!!) This is the way from now on. I know, I know — fried is not good for you, but we don’t do it THAT often. The other blogger bite comes from Grace at A Southern Grace. She posted some Pecan Pie Muffins that were absolutely heavenly. And please follow her suggestion to use muffin papers, because they will stick to the pan even if you slather it in butter/spray. Mine aren’t much to look at, but don’t let that fool you. These. Are. Darn. Good!!! DARN GOOD!!!. In addition to those, tonight was the Band Banquet and Seniors were to bring the dessert. I gave The Hunk several choices – Banana Pudding, Dump Cake, Punch Bowl Cake, Cupcakes. He chose Banana Pudding. Remember how mom used to make it. Just pudding with some bananas and nillas thrown in and around. Well, bloggers, times have changed – big time. Now it is bigger and better. This recipe has been around for a while, but here it is again in case you get the craving. Mix together the pudding and milk until well blended. Fold in the whipped topping. (Some recipes call for 1/2 of the container, some called for all – I used about 2/3 of the container.) Layer the wafers, then the bananas. Pour at least half of the pudding over the top. Repeat. Top with wafers/bananas or whipped cream. I made a triple recipe and ended up with enough to fill a 7 quart bowl (and they ate. it. all!!!) This is all I had left. Three little ramekins. Two bites each. Good. Just enough.